Next in The Planetary Society's 365 Days of Astronomy doubleheader is Planetary Society President Jim Bell, whose show, airing today, is on "Five Years of Living Vicariously on Mars." It's in honor, of course, of the fifth anniversary of the landing of Opportunity. 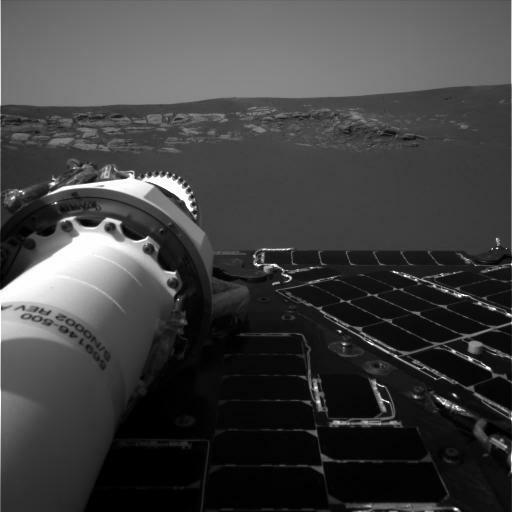 Speaking for myself, I will never forget the moment in the Science Assessment Room in mission operations at JPL when Opportunity transmitted the first image from its Navigational Camera, taken before the mast had even been raised, providing a first peek at its landing site. And what a landing site! Instantly the entire roomful of scientists roared, because it was pretty clear what we were looking at: bedrock. Rocks sitting where they formed, in context -- a dream for geologists. Opportunity took this image and sent it home shortly after landing on its first Martian sol to blow away the waiting, bleary-eyed scientists and journalists. The transcript of Jim's podcast is copied below. Jim is also the star of this week's Planetary Radio Podcast. To read the most thorough history of the rover missions that exists anywhere, you have to check out A. J. S. Rayl's monthly articles on the rovers' adventures (here's the archive from 2008, 2007, 2006, 2005, 2004, and 2003). That claim is true, by the way -- I've even heard from mission team members that they use her articles as the best resource to remind them what happened, when, on both missions. You can see the marvelous color images from Spirit and Opportunity's cameras on the Pancam website at Cornell University. And, in case you missed it, I'll point out again that I did an earlier podcast, on January 3, in honor of the anniversary of Spirit's landing. Hey there, I'm Jim Bell, an astronomer and planetary scientist from Cornell University in Ithaca, New York. 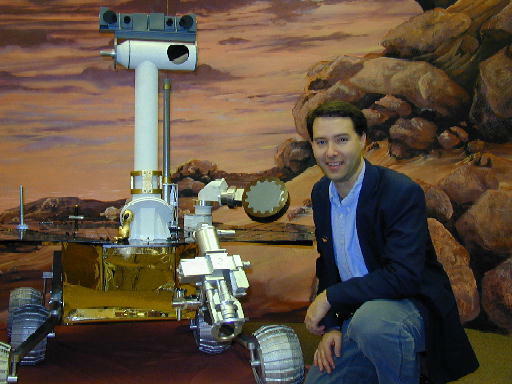 I'm the lead scientist for the Mars Exploration Rovers "Pancam" color cameras, and I'm also President of The Planetary Society, the world's largest space-interest group. It's amazing to realize that for five years now, a merry band of scientists and engineers from the planet Earth have been living, virtually and vicariously, on the planet Mars. These people are, of course, the hundreds of men and women who have been operating the Mars rovers Spirit and Opportunity since January of 2004. The team has been sending the commands to drive the rovers, to collect more than 200,000 photos and other scientific measurements, and to analyze and interpret the rovers' findings. However, what is now a team of a few hundred people is really only a small subset of the many thousands of people from around the world who have helped to design, build, test, and operate the rovers over the past decade. And even that group is really only a small subset of the countless many more people who have been following along with the mission on the internet, downloading images, blogging, and twittering along with the team and the rovers. I can't even imagine how many people are out there living their "second life" virtually and vicariously on Mars. Astounding. Thinking about the Opportunity rover in particular as we approach the fifth anniversary of her landing on Mars, I am continually struck by the remarkable good fortune and string of scientific successes that have come from this rover's mission. The way scientists work - across the boards, not just in astronomy and space exploration - is by coming up with ideas to try to explain what we observe in nature and in the laboratory. If these ideas are well-developed and testable, we have a special name for them: we call them "hypotheses." Well, a critical hypothesis about Mars, developed from decades of observing the planet from telescopes and space missions, is that the planet used to be warmer and wetter and much more Earth-like than it is today. The Mars rovers and their science instruments were designed to test that hypothesis by searching for evidence in the geology, geochemistry, and mineralogy of the surface, for liquid water having once been stable on the surface. If such evidence could be found, it would mean that the cold, dry, thin-atmosphered Mars of today must have had a very different climate long ago. Essentially, by searching for evidence of liquid water and its associated potential environments, the Mars rovers are testing the hypothesis that Mars may once have been habitable for life as we know it. While scientists pose and test hypotheses all the time, I can assure you that it's rare to actually nail one - that is, to definitively and conclusively come up with a yes or no answer. During the past five years, however, that's just what the Opportunity rover team has done: Mars was habitable. It really was. We've found the smoking gun evidence. That evidence comes from discovering rocks and minerals, like certain kinds of "hydrated minerals" that could only have formed either directly in liquid water, or from the slow evaporation of salty liquid water deposits. In fact, some of those minerals, like certain kinds of hydrated sulfates, still contain some of that ancient water, locked into the structure of these mineral deposits. The Spirit rover team has also found evidence of hydrated minerals on the other side of the planet, so Mars wasn't just habitable where Opportunity is driving around in Meridiani Planum, but in other places like Gusev Crater as well. And the NASA and European Space Agency orbiters studying Mars from above have also found evidence of hydrated minerals in many other places. It turns out that lots of Mars was habitable! The Opportunity team has found other pieces of habitability evidence as well, like small-scale deposits of layered sedimentary rocks; small, sandy ripples that may have formed from ancient shallow-water waves sloshing sand to and fro on the surface; and non-hydrated mineral features (like the famous little spherical, hematite-rich, so-called "blueberry" grains found all over Meridiani Planum) that could also have formed in a watery environment. And these discoveries were not made in just one place. Throughout the nearly 14 kilometers of Opportunity's traverse from Eagle Crater to Endurance Crater to Victoria Crater, and across the flat, sandy plains between and beyond these impact-created "roadcuts," the rover has repeatedly encountered hydrated minerals, hematite-rich blueberries, and layered sedimentary evaporite rocks. The rover's visits inside craters have shown that the watery history was extensive not only in space across the region, but also in time, as measured in sediments down below the Martian surface. Mars was habitable for some significant periods of geologic time. But for how long? And when, exactly? The results from the rovers aren't often described as "frustrating," but for me at least, there is some of that feel. The rovers are great robotic field geologists - probably the best ones yet invented by people. But still they are limited in their capabilities. And one of the things they can't do, but which geologists do all the time in fieldwork on Earth, is to determine the ages of the rock formations being studied. We know from counting impact craters in the region and making certain assumptions about how often craters form on Mars, that Opportunity's playground in Meridiani is ancient - perhaps 3 to 4 billion years old. But exactly how ancient are those rocks? How long was the water there on the surface? How long was the climate habitable? My astrobiologist friends, especially, really want to know the answers to those questions, because there are critical implications for whether Mars was just habitable versus inhabited. I hope the rovers keep going and going-for another five years, maybe even longer. They are helping us to decide where, when, and how to start the next phases of Mars exploration - robotic sample return and then, eventually, human exploration. Maybe the fifth anniversary of the historic landings of Spirit and Opportunity on Mars is also the minus-tenth anniversary of the first robotic Mars sample return mission, or the minus-twentieth anniversary of the first human landing on Mars. No one knows exactly how the future of Mar s exploration is going to unfold, but everyone agrees that that's the direction that we're heading. It's going to continue to be an exciting ride, and I hope you continue to follow along and join in, during this exciting International Year of Astronomy, and beyond.